This is the spectacular Turnagain Arm tour, where some of the best scenery in Alaska resides. We start the day off around noon by picking you up at your hotel and heading to Mt. Alyeska. The summit of Mt. 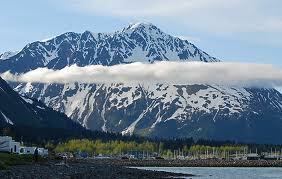 Alyeska is almost 4,000 feet high and its slopes average 54 feet of snow every year. We’ll take a tram up to 2,280 ft and the viewing decks of the Roundhouse Museum. Weather permitting, we’ll see several glaciers from this viewpoint, as well as Turnagain Arm from the museum’s viewing decks. Then we’ll take the tram back down the mountain for lunch at our favorite eatery at the base of the Chugach mountains. You’ll feast on the bottomless soup of the day, famous sourdough bread, and delicious desserts. A beverage is included. Enjoy lunch family-style indoors, or outside among this place’s beautiful flowers. After an Alaska-sized lunch, we’ll travel on to the Alaska Wildlife Conservation Center, a rescue and rehabilitation organization for Alaska’s wild mammals. Here we’ll view grizzly bears, eagles, families of elk and bison, lynx and other furry friends. Up next it’s glaciers! We’ll get up close and personal with Portage Glacier on a 1-hour cruise across Portage Lake. An on-board naturalists will share interpretive facts and stories about the land, the local flora and fauna, and the beautiful glaciers of the Portage Valley. Together we’ll learn about glaciers and watch (and listen) to Portage Glacier, which once filled the entire valley and connected what are now five separate glaciers. Your captain aboard the MV Ptarmigan will take you to a safe distance from the edge of the glacier so you can experience its radiant hues and ancient power.